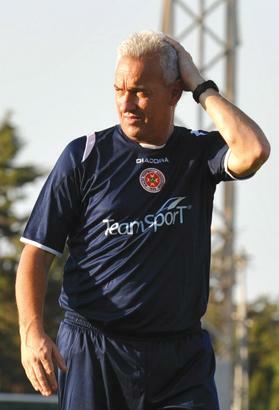 John Buttigieg is the new technical director of the Floriana nursery. Former Malta coach John Buttigieg has reached an agreement to become the technical director of the Floriana nursery, the Premier League club said in a statement yesterday. As reported by Times of Malta last week, the administration of the Floriana FC nursery, headed by Hugh Peralta, had earmarked Buttigieg as their preferred candidate to take up the post of technical director. Their efforts to lure a former club stalwart to spearhead their youth sector have now paid off as Buttigieg has agreed a two-year contract with Floriana. Buttigieg’s appointment represents something of a coup for Floriana as they have secured the services of a fully-qualified coach who was in charge of the senior national team a few years ago. The 51-year-old had signed a five-year deal after taking over from Dusan Fitzel in 2009 but his reign came to a premature end after Buttigieg was dismissed by the Malta FA in October 2011. Regarded as one of the finest defenders in the history of Maltese football, Buttigieg had a successful spell with Floriana in the nineties. Buttigieg will work together with John Holland after the former Malta and Floriana player was named head coach of the nursery. Meanwhile, Floriana’s senior squad last week started their pre-season training under the guidance of Italian coach Giovanni Tedesco who had replaced Englishman Ian Dawes for the final three Premier League games last season. The Greens, led by president Riccardo Gaucci, have signed Steve Pisani on a permanent basis after the Malta U-21 winger impressed during his loan stint with the club last season. Scottish wing-back Gary Muir and Brazilians Igor Coronado and Rodrigo Felix Aguiar have been retained from last season. Floriana have recruited two new foreigners, Italian striker Matteo Piciollo, who played for Ostiamare last season, and Brazilian Emerson Marcelina who turned out for Romanian club Viitorul last season. Young striker Giovanni Galea has also moved to Floriana on a season-long loan deal from Sirens. Elsewhere, Naxxar Lions have strengthened their forward line with the signing of Terence Vella from Birkirkara. Vella, who is also part of the national squad, joins Naxxar on loan for one season.